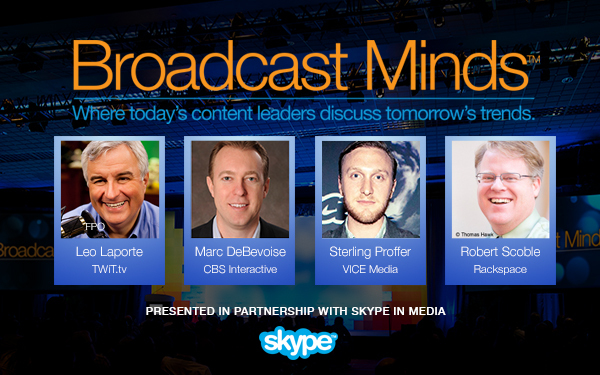 LAS VEGAS – March 26, 2015 – NewTek™today announced that Broadcast Minds™, the go-to panel at NAB providing insight from leading voices in the modern digital landscape on the future of broadcast communications, is returning for its sixth year at the NAB Show. This year’s event is presented in partnership with Skype in Media and will feature dialogue between industry experts from CBS Interactive, Rackspace, and VICE Media. The discussion will be held on Monday, April 13 at the Las Vegas Convention Center South Hall Room S222. Doors open at 4:30 p.m., PDT. The panel discussion will start at 5:00 p.m.